Submitted photo Senior Center Liaison Tim Brickey updated Greene County Council on Aging’s sign March 21 with the coinciding of the first day of spring and an overnight snowfall. The council is located at 1195 W. Second St., Xenia. 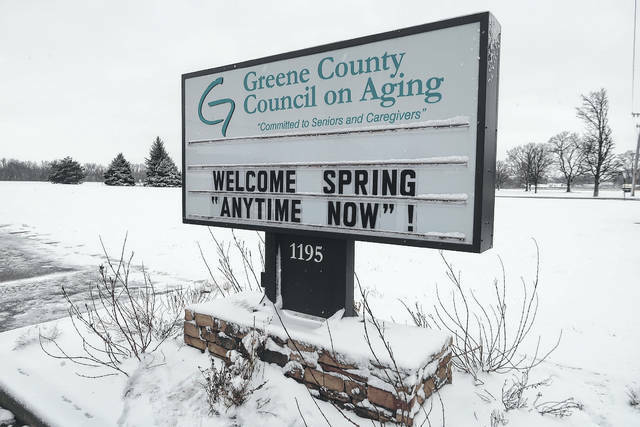 Senior Center Liaison Tim Brickey updated Greene County Council on Aging’s sign March 21 with the coinciding of the first day of spring and an overnight snowfall. The council is located at 1195 W. Second St., Xenia. https://www.xeniagazette.com/wp-content/uploads/sites/32/2018/03/web1_gccoa.jpgSubmitted photo Senior Center Liaison Tim Brickey updated Greene County Council on Aging’s sign March 21 with the coinciding of the first day of spring and an overnight snowfall. The council is located at 1195 W. Second St., Xenia.